Mile Oak came from behind to make it four wins in six SCFL Division 1 matches since the turn of the year on Saturday. 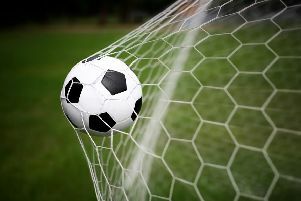 Adam Dine’s penalty and George Rudwick’s winner - both of which came after the restart - wrapped up a 2-1 victory for Anthony Whittington’s troops at struggling Midhurst & Easebourne. There were concerns over whether the fixture would go ahead given the bad weather in the build up. But a pitch inspection was passed and although admitting it was not a vintage display from his side, manager Whittington took pride from another league triumph. He said: “We were not at our best despite a good start and missed a golden opportunity to go 1-0 up. “Credit to the players in the second half, we were much better and showed a lot of character. Jack Stenning squandered a great chance inside five minutes. The forward went through on goal but fired wide with the goal gaping. Goalkeeper Aaron Stenning was then called into action, pulling off a fine save from a free-kick. Enzo Benn, making his first appearance since re-joining the club from Southwick, heading across goal for the waiting Craig Anderson but the hosts managed to clear the danger. But it was Midhurst who made the breakthrough seven minutes before the break. Josh Sheehan took a heavy touch but was brought down in the area. Kieran Carter stepped up, slammed the penalty home to fire the hosts ahead. Mile Oak were awarded a penalty just shy of the hour to get level. Dine made not mistake from the spot after Nathan Casselton had handled. There was a controversial moment soon after. Midhurst did not kick the ball out of play with Eric Wedge-Bull down injured. Goalkeeper Aaron Stenning then picked the ball up and initially it looked as though a backpass would be awarded but after consultaion with his linesman, a goal kick was given. Both sides were searching for a leveller and it was the visitors who went on to take all three points. Substitute Jamie McKenzie superbly controlled a pass before picking out an unmarked Rudwick to win it for Oak. Mile are back in action on February 23 when they host Storrington. MILE OAK: A.Stenning; Early, Hall, French, Wedge-Bull, E.Benn, Rudwick, Foster, J.Stenning, Dine, Anderson. Subs: Mckenzie, Schooley, Rewell, Gillingham.